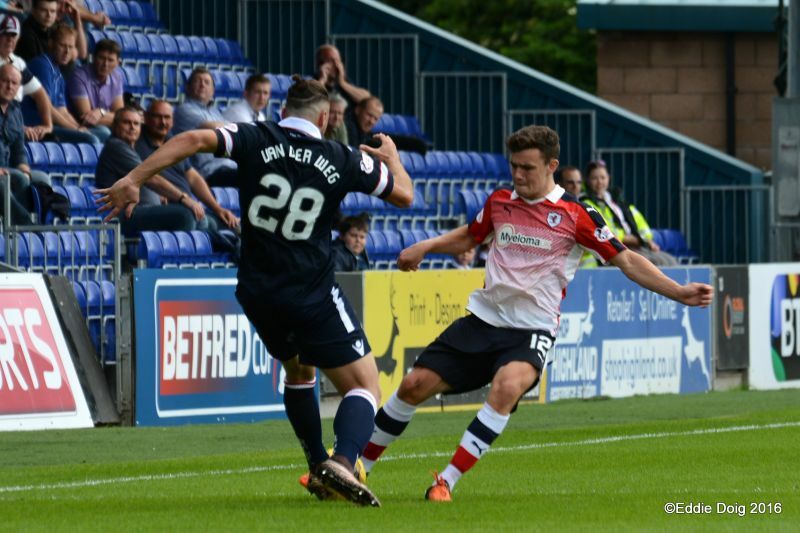 Raith Rovers maintained their early season momentum, with an excellent result, and perhaps more importantly, performance, with a 4-3 win on penalties, after a 1-1 draw at the home of the League Cup holders, Ross County. 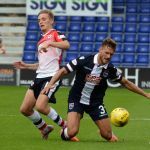 Manager, Gary Locke handed debuts to two recent signings, with Frenchman, Jean-Yves M’voto lining up in the heart of the defence, while Declan McManus started up front alongside Lewis Vaughan. 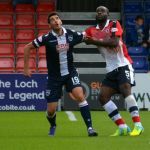 With the two new additions joining the fray, it meant Chris Johnston was dropped to the bench, while forward, Yaw Osei also had to make do with a seat in the dug-out. 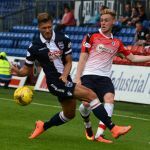 The rejig to the personnel saw Ross Matthews shuffled along from his more accustomed central position to wide on the right, as Ian Davidson moved forward to play in the centre alongside, Ross Callachan. 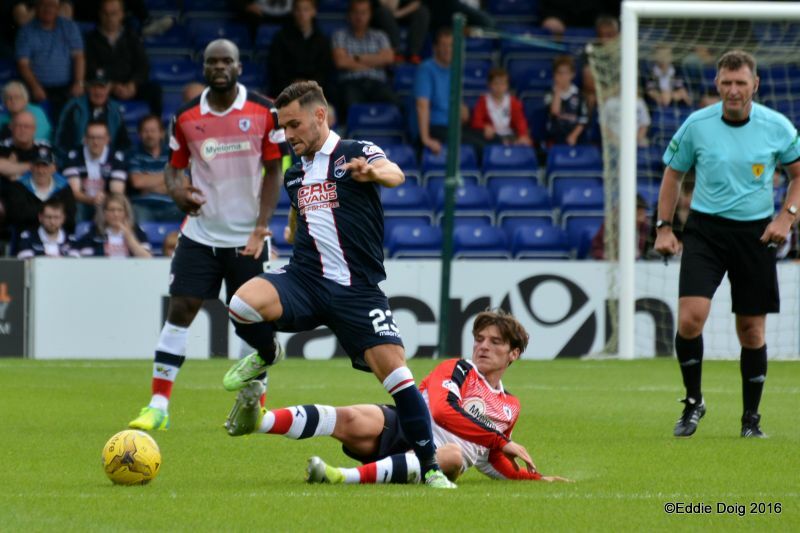 Former Rover, Brian Graham had to be content with a place on Ross County’s substitutes roster, despite his late penalty proving to be the decisive factor as Jim McIntyre’s outfit edged out Montrose by a goal to nil in their previous Group D match. In a portent of things to come, the fixture began with Rovers on the front foot. 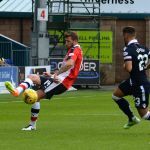 Bobby Barr was looking bright in the match’s opening moments, forcing recently signed right-back, Erik Cikos into evasive manoeuvres as he struggled to cope with the winger’s pace and energy. Despite the positive opening, it was County who made the first half-chance, when Liam Boyce made inroads towards the Rovers penalty area, before playing in Ian McShane, whose cross-shot was blocked by the imposing figure of M’Voto. 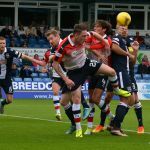 Buoyed by that, County started to look more threatening, and Craig Curran blazed a chance over from twelve-yards, after he’d been slipped through by Chris Robertson. 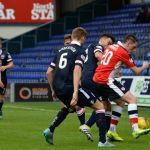 The match had settled into an entertaining, back-and-forth affair, albeit one that lacked a goal, but that all changed in the 17th minute, as Raith snatched the lead. Good work down the right from Vaughan, saw him pick out the oncoming McManus, who jinked outside and fizzed a low cross across goal, which the unfortunate Cikos, who wasn’t having the best of starts, slid into his own net. 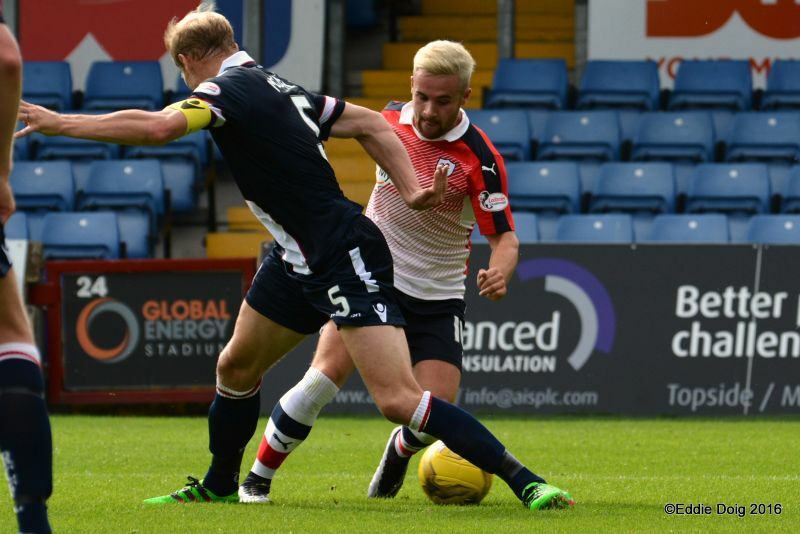 While the strike was certainly fortuitous, it was great reward for Raith’s enterprising start to the match. 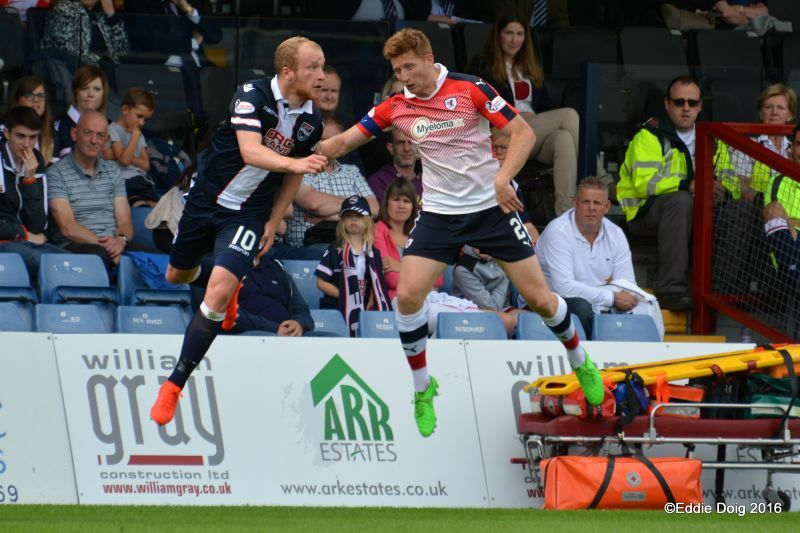 The Staggies were struggling to chisel out too many opportunities, with the new defensive partnership of M’Voto and Benedictus looking solid, while Davidson and Callachan were forming a fine defensive shield in front of them. 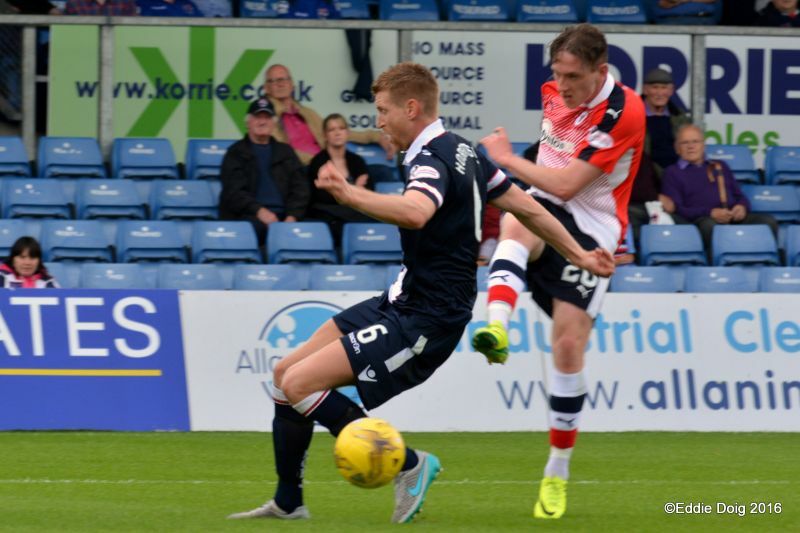 That said, County missed a glaring chance to equalise just before the half-hour-mark, when an excellent cross from the right from Michael Gardyne, was wastefully headed wide by Richard Foster, after he’d found an alarming amount of space at the back-post. 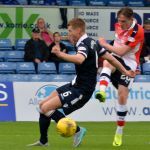 Rovers responded immediately though, and McManus looked sharp as he sprang the home side’s offside trap, with only the alertness of Scott Fox preventing Rovers doubling their advantage. 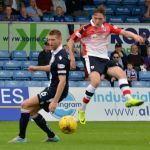 The early signs of Vaughan and McManus’s partnership looked promising, and the former almost played in the latter, as Vaughan’s forward pass split the County centre-halves, and again, Fox had to rush out to block. 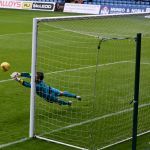 With ten minutes of the half remaining, Fox, who had been the busier keeper by some margin, was called into action again, punching away a Bobby Barr shot from 20-yards, as Rovers looked to capitalise further on their superiority. 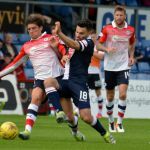 It was the final noteworthy piece of action in a half which Raith had impressed upon for large swathes. Jim McIntyre, who was presumably non-plussed at what had unfolded in front of him in that opening period, saw fit to make a change at the interval, with Martin Woods replaced by Chris Routis. 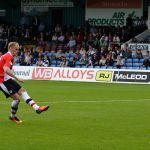 However, it failed to have any immediate effect, with Rovers continuing to look dangerous on the break, as Kevin McHattie saw his shot blocked on the edge of the area. 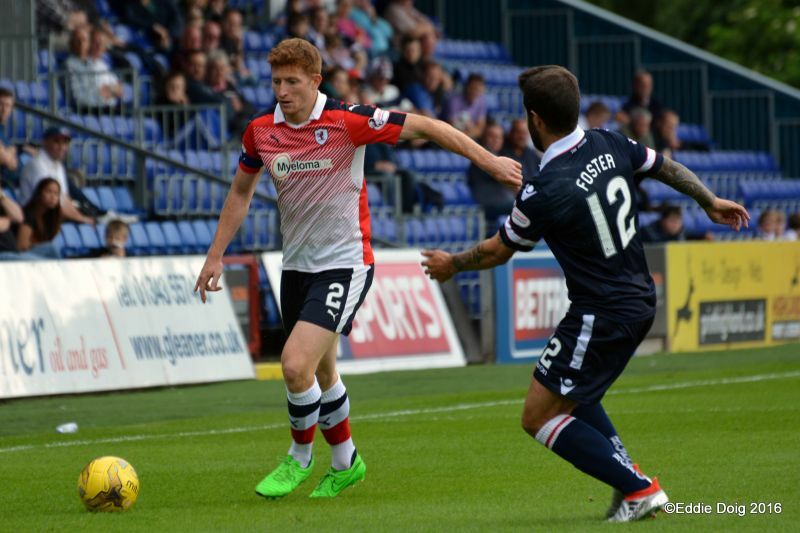 That said, Ross County really should have drawn level within ten minutes of the restart, as Foster sprinted down the left, and with Gardyne in a huge area of space inside the area, all Foster had to do was place the ball anywhere within the vicinity of his all-on-his-lonesome colleague. 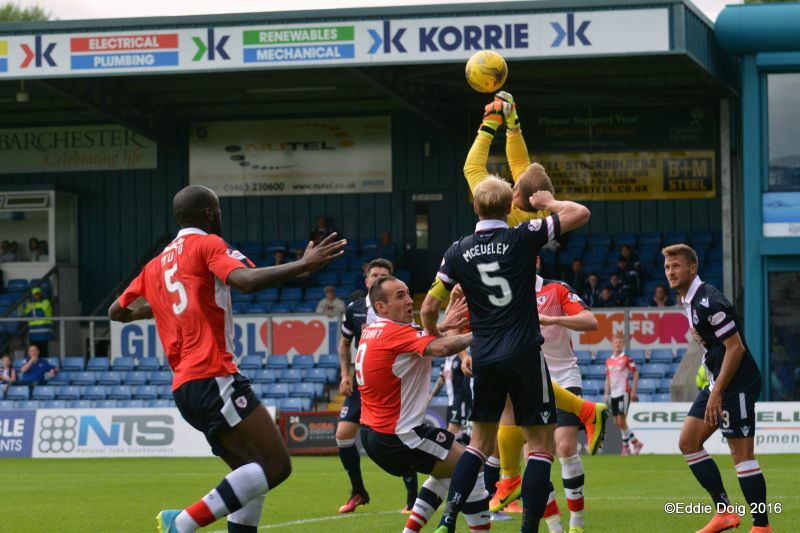 Thankfully from a Raith perspective however, Foster’s cross corkscrewed into the home end behind the goal, and a fine position was squandered. 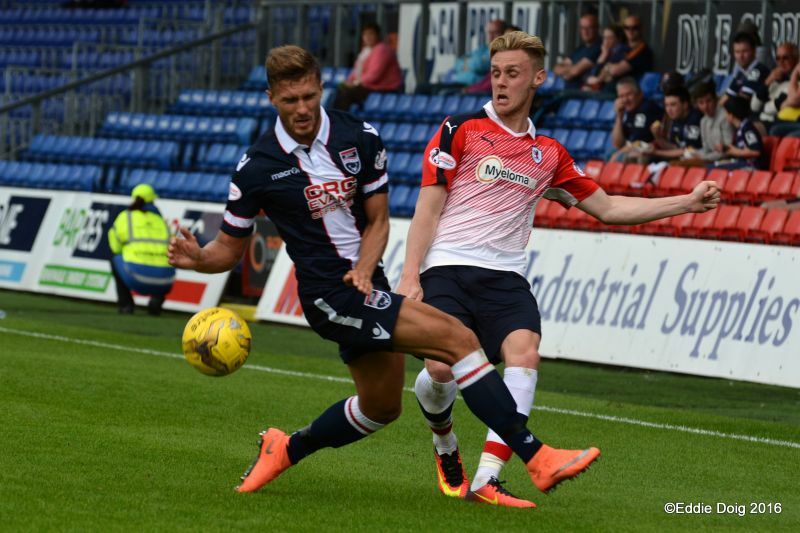 Locke’s team were looking good on the counter, but County had a bit more zip about them in the second-period, without really testing Kevin Cuthbert, although Raith did have a let-off on the hour-mark, as Gardyne went down under a challenge in the box from M’Voto, but referee, John McKendrick was unmoved. With twenty minutes remaining, Rovers fans were presented with the ominous sight of Brian Graham being stripped for action, and their fears were proven to be justified, when he won a penalty with quarter-of-an-hour left, going down after coming into contact with Jason Thomson. 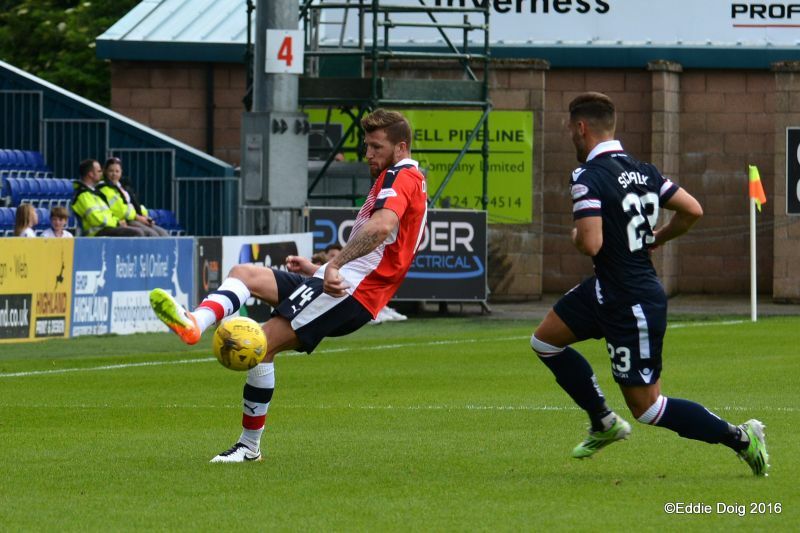 Graham took the kick himself, placing the ball to the keeper’s right, with Cuthbert electing to go the other way. 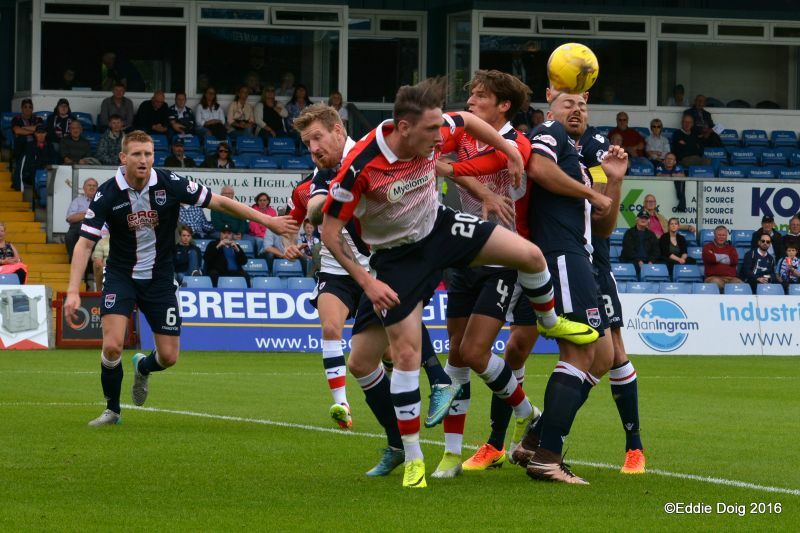 Mark Stewart had given the team fresh legs as he replaced Vaughan, but it was Ross County who entered the closing stages with a spring in their step, with Robertson blasting over on the volley from the edge of the area, as Raith struggled to deal with a corner kick. Davidson almost won it in the closing stages though, as he tried an audacious 30-yard effort which didn’t quite dip enough, with Fox looking beaten as he back-peddled furiously. 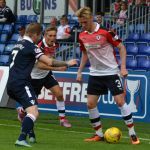 With five minutes remaining, Locke made his second and third changes, with Scott Roberts and Chris Johnston replacing Barr and Matthews, but with time against them, neither could swing the match towards Rovers in regulation time, as the match headed to penalties. The shoot-out swung one way and then the next. 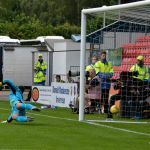 Standing at two each, with Kyle Benedictus and Mark Stewart successful with their efforts, it was advantage County when Fox stopped Callachan’s penalty low to his left, but that was short lived, as Gardyne saw his attempt stopped by Cuthbert in the same spot. 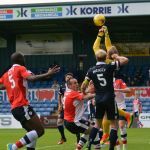 It looked like the bonus point would be staying in Dingwall, when Thomson’s kick rebounded off the inside of the post, and although McManus kept Rovers in it as his shot hit the back of the net via Fox’s foot, Jay McEveley spurned the chance to win it, when Cuthbert excellently saved to his left. 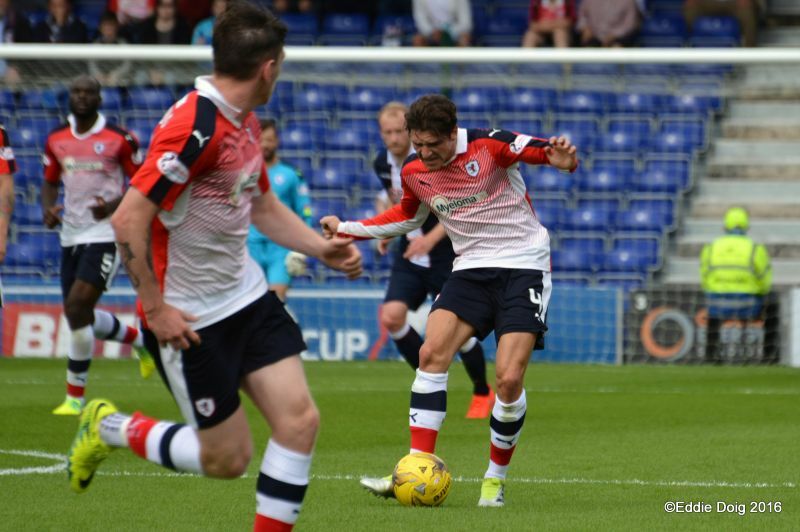 Kevin McHattie then safely tucked his away, before Ian McShane slashed his penalty wide, handing Raith the two points they thoroughly deserved. 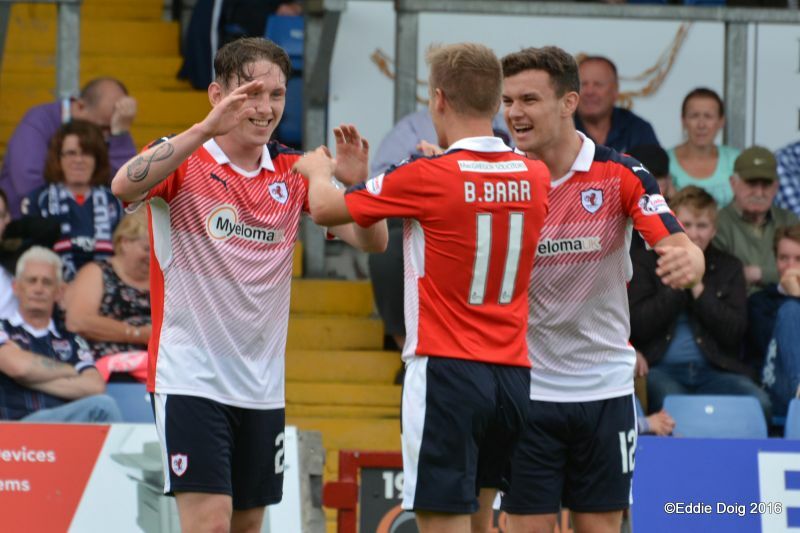 The victory means that Rovers will now head into next weekend’s match against Alloa, knowing a win will guarantee them top place in the group, and qualification to the next round. Welcome to the Global Energy Stadium, it's 19 degrees and slightly cloudy. Playing for the Staggies is old Rovers favourite, HSWHW, Brian Graham. 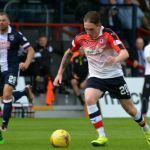 In the team for the Rovers is debutant Declan McManus. I offer apologies in advance if the updates are slow, this us due to the Wifi. County kick off towards the North Stand. McManus looking eager to please his new gaffer. Matthews doing well at centre right, making Curran look like a school boy. 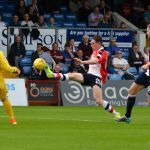 McManus closing down on Fox a deflection gives County a bye kick. 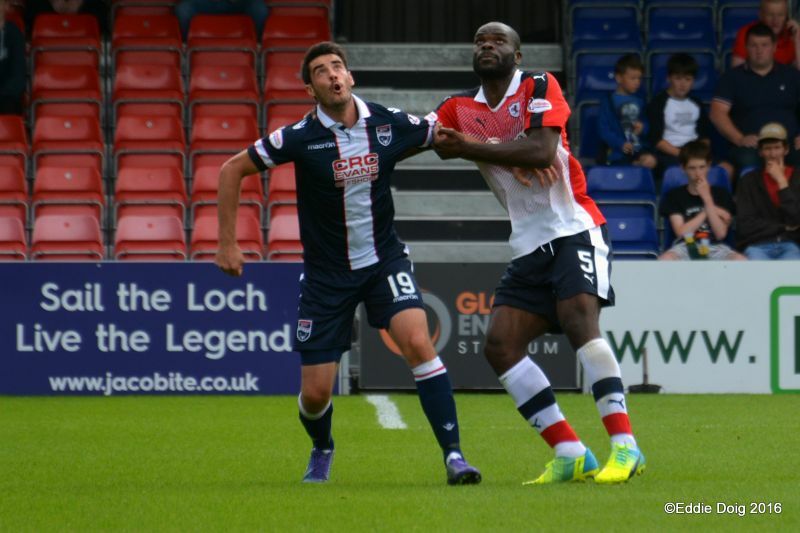 Shouts for a penalty as Benedictus looked to have handled, Mr McKendrick waves on play. 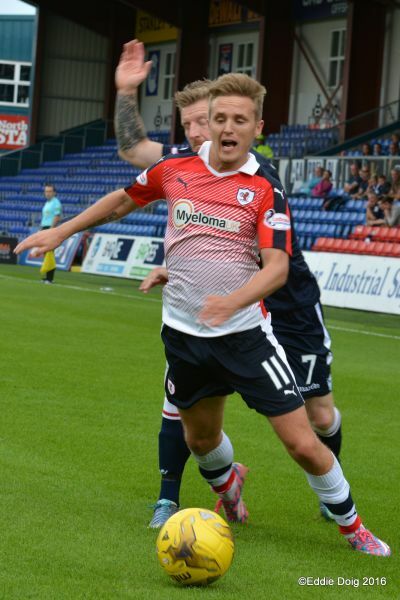 Thomson hits a 40 yard free kick into the box, McHattie gets a header and the ball is held by Fox. M'Voto holding off Curran with ease to clear. Rovers conceded a free kick, Robertson skies the ball over the bar. Vaughan passes across the mouth of goal and Cikos clips the ball into his own net. Curran yellow for a foul. Van Der Weg protest for territory falls on deaf ears as Mr McKendrick waves play on. Foster unmarked at the back post heads past the opposite stick. 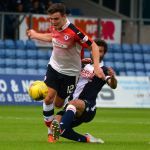 Fox blocks an excellent effort from McManus from close range. 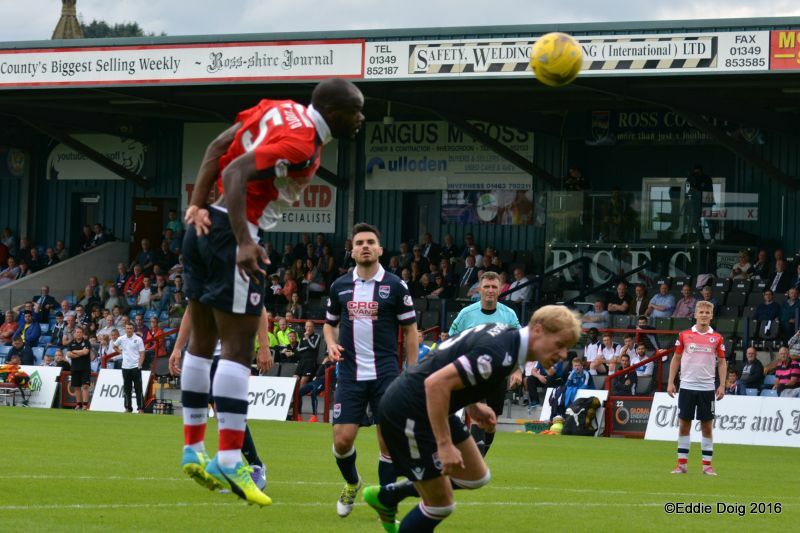 Vaughan skies the ball over the Jailend stand from 30 yards. Callachan received a warning from the ref for a foul on Woods. Woods being helped from the pitch. Woods back on the field. Agreat ball from Vaughan is just scooped clear by Fox from the in rushing McManus. Rovers putting County under the cosh. Rovers are looking good without trying too hard at the moment. 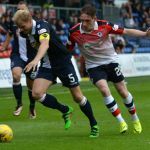 McHattie and Gardyne clash heads. HT substitution, Woods off, Routis on. Rovers doing the early pressing after the break. Foster doing a lot of work on his own and by the nick of his shot he had run out of puff. 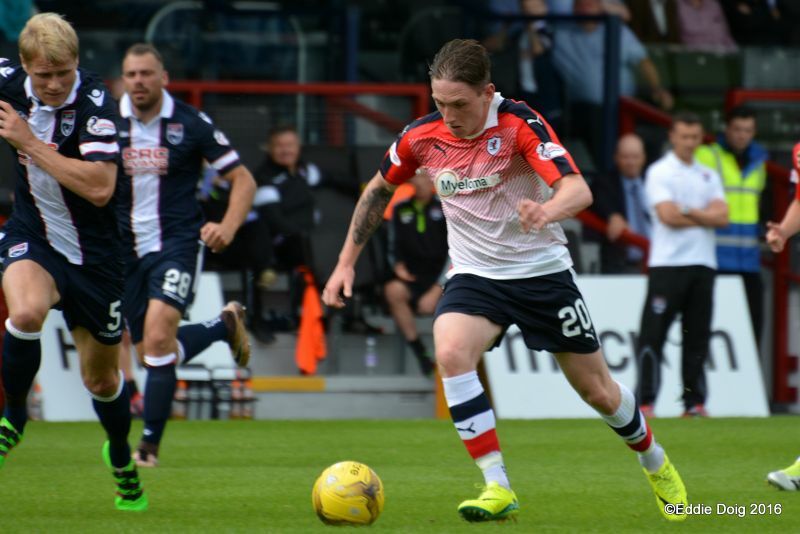 McHattie is limping off for treatment. Cikos downs Barr just outside the area, Vaughan's low free kick goes just by the back post. M'Voto down in the box after a clash with Gardyne, the home fans shout for a penalty. 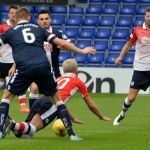 Gardyne yellow for a foul on Barr. Vaughan again with the free kick, this time collected by Fox. 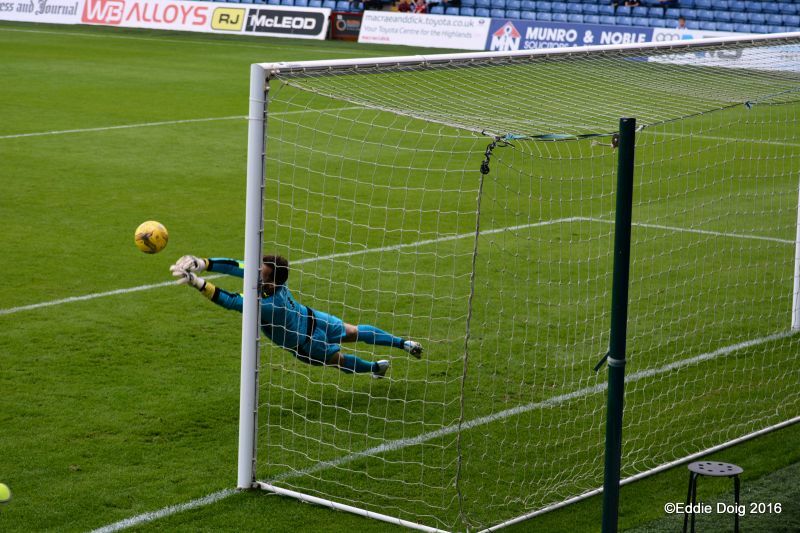 Van Der Weg hits the ball over the bar from a tight angle. 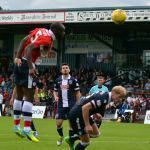 Big Jean-Yves with a header from a corner looking for hand ball from the ref, play on. 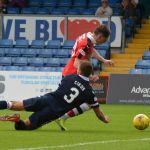 McManus with back to goal turns but is impeded by the defender. 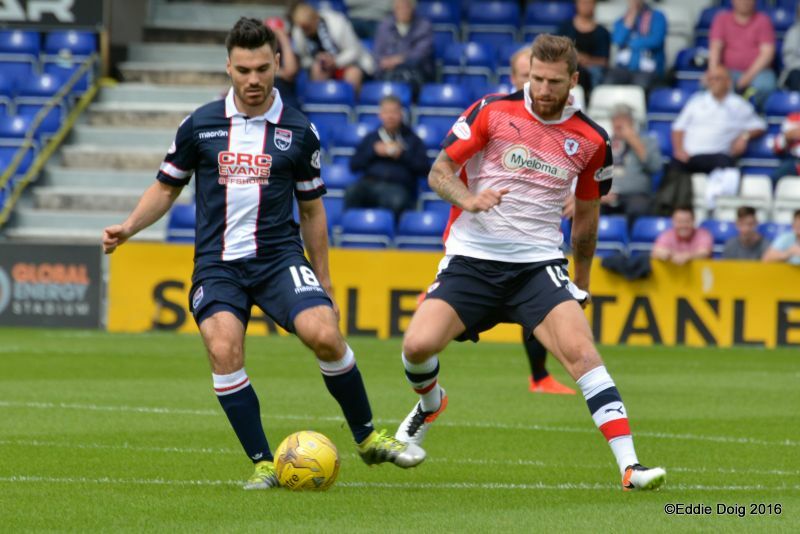 Cuthbert who has rarely had anything to do rushes out to deny Gardyne. M'Voto and Graham engage in a duel going for the ball, the former prevailing. Penalty, Thomson brings down Graham who sent Cuthbert the wrong way and scored. Goal County. McShane floating in a corner to Robertson who fires the ball over the bar. Graham shoots at the near post but is offside. 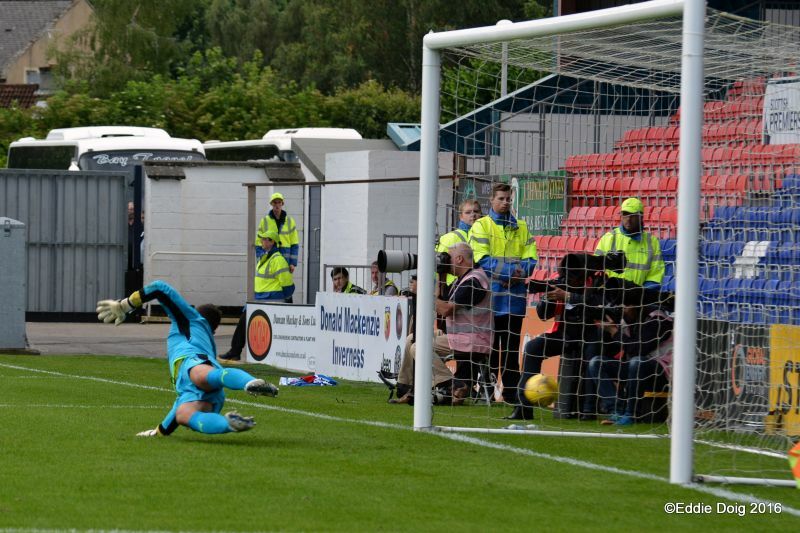 A long range shot from Davidson dipped just over the bar. Benedictus with a free kick in his own half found Jean-Yves who headed just past the back post. 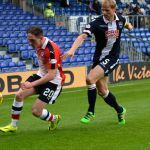 Matthews and Barr off Johnston and Roberts on. +1 Full time, now penalties. 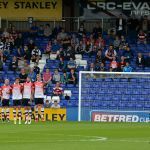 Penalties to be taken at the Rovers end. 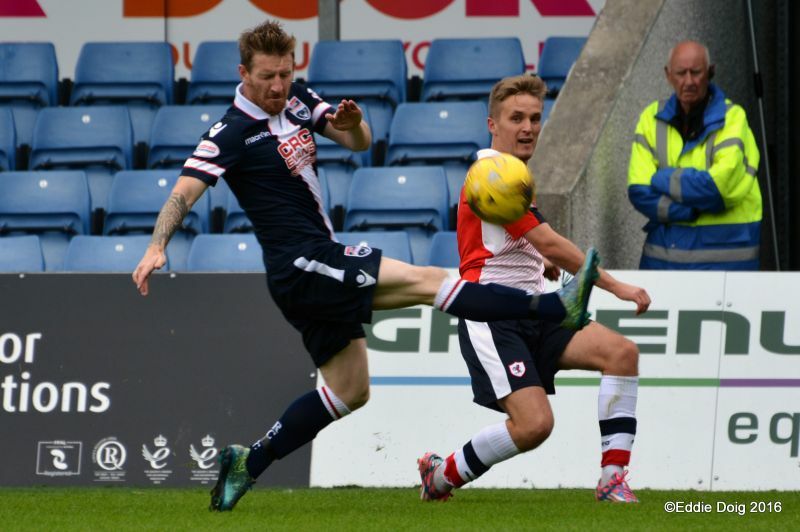 McShane missed wide left 4-3, Raith Rovers gain the extra point. Fox, Woods, Boyce, Foster, Curran, Robertson, Van Der Weg, McShane, McEveley, Gardyne, Cikos. Subs, McCarey, Graham, Franks, Dingwall, Schalk, Routis, Quinn. Cuthbert, Thomson, McHattie, Callachan, M'Voto, Benedictus, Vaughan, B Barr, Matthews, Davidson, McManus. Subs, Lennox, Johnston, Osei, Roberts, Stewart, Bates, Court. 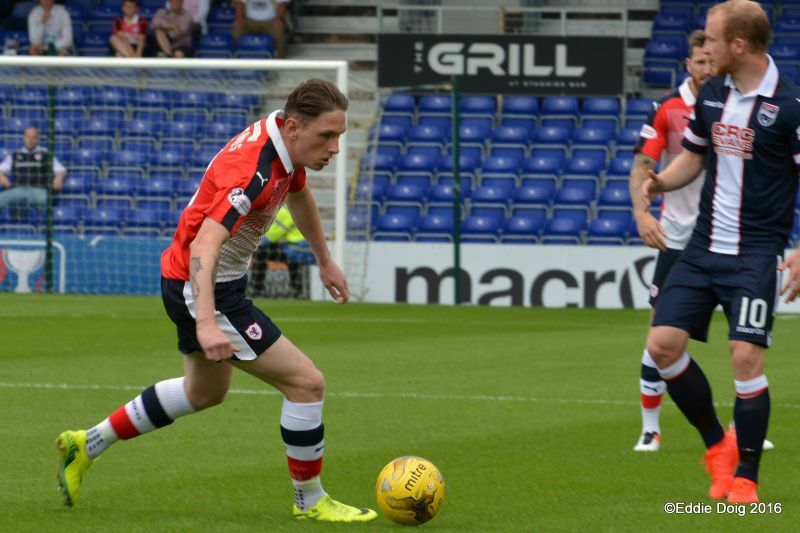 Iain Davidson keeping his eye on Ian McShane and the ball. 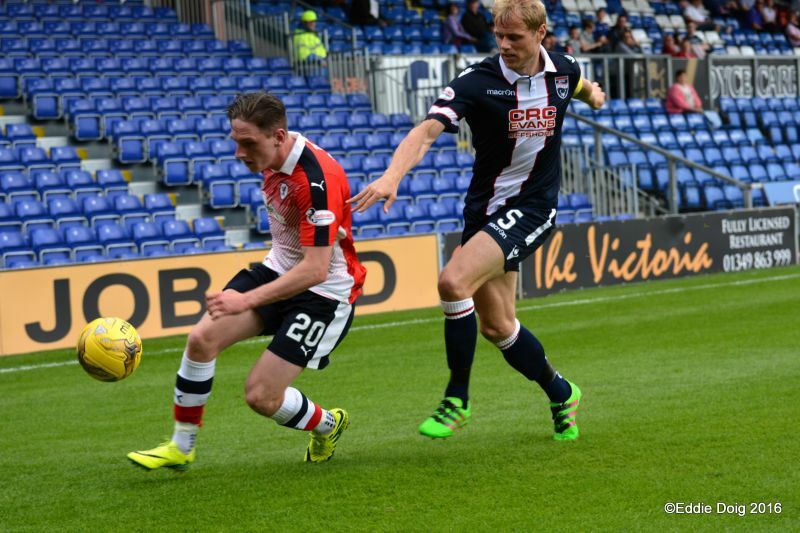 Kevin McHattie and Bobby Barr. 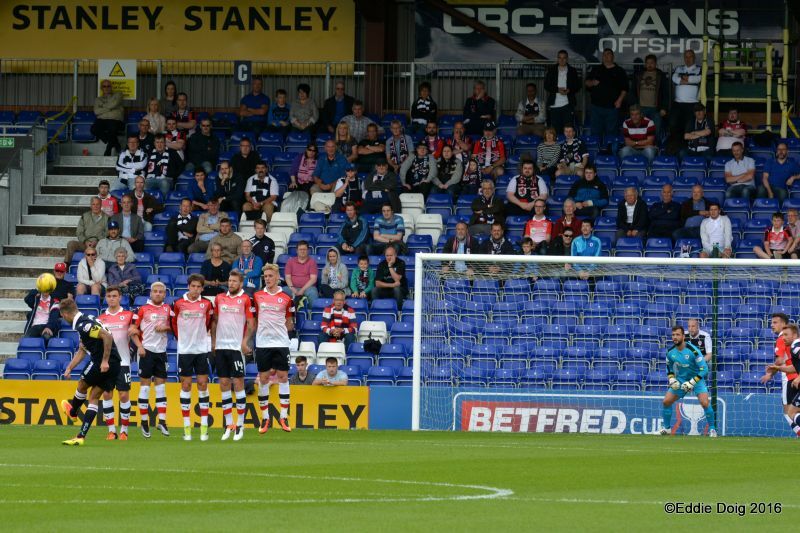 The Rovers fans look on as anxiously. 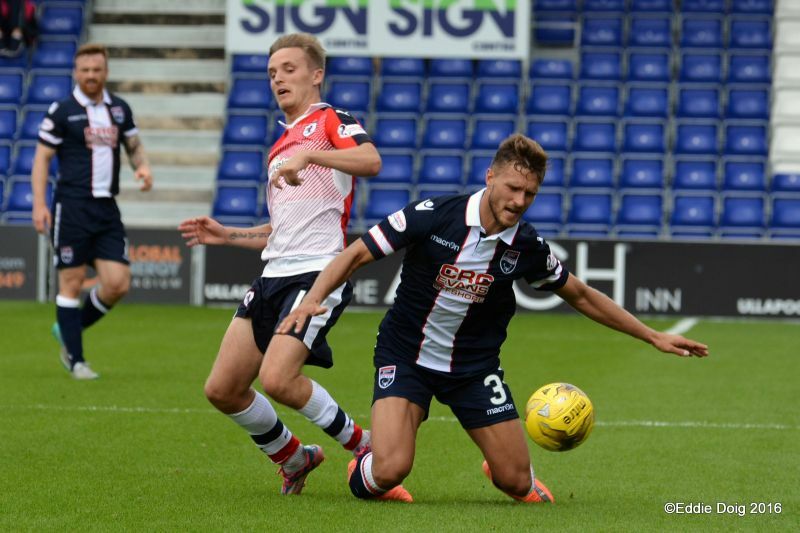 McManus sends the ball goalwards which was knocked home by the Ross County defender Erik Cikos. Bobby Barr and Ross Matthews congratulate Declan McManus. 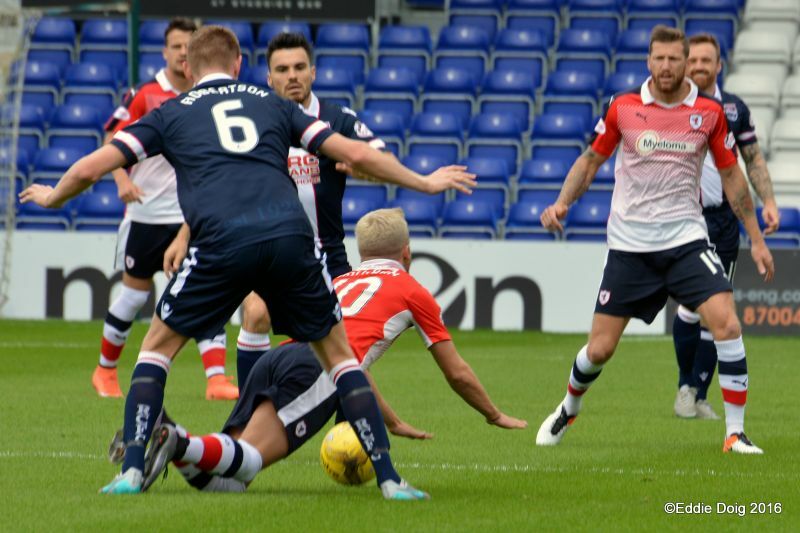 Bobby Barr fouled by Gardyne. 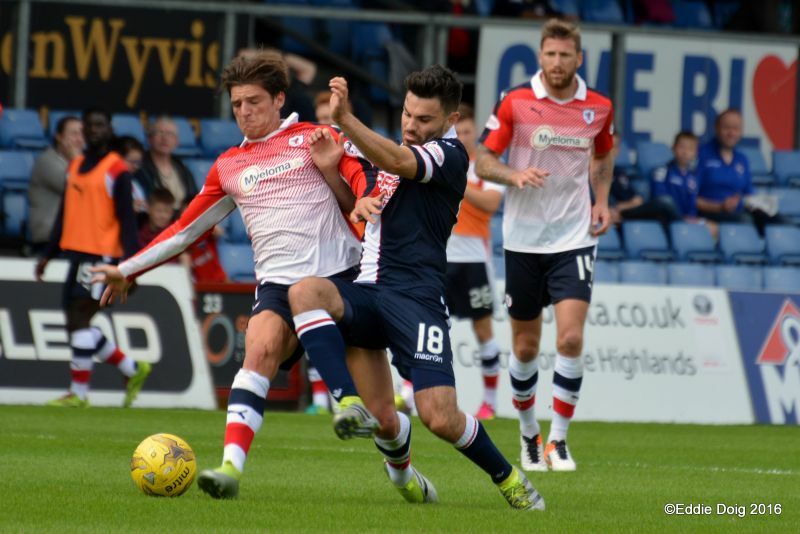 Ross Callachan and Ian McShane. 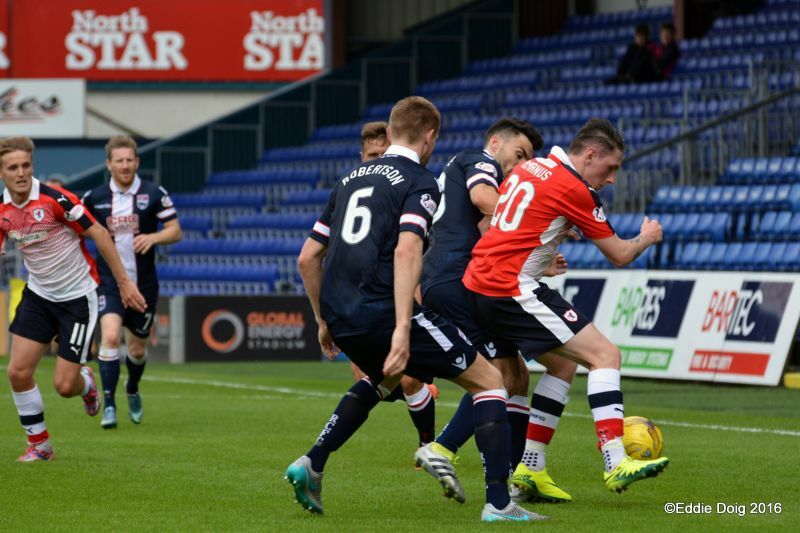 Barr looks on as McManus is surrounded by the Ross County defence. 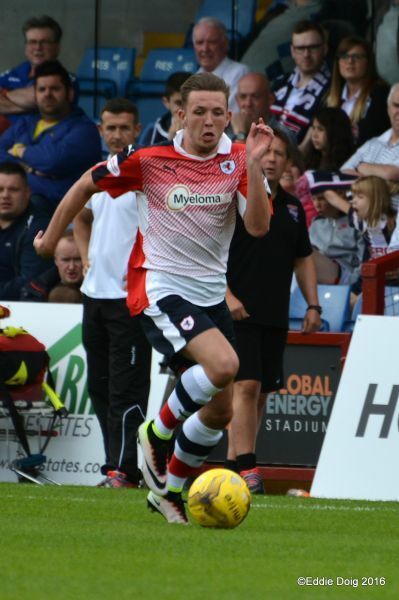 .... but the ball is safely gathered by Scott Fox. Bobby Barr tries his luck from the edge of the box. 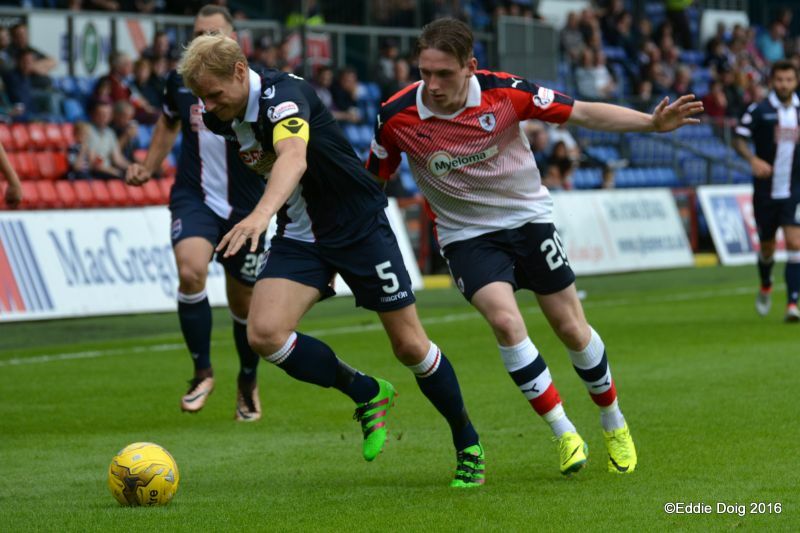 Liam Boyce and Jason Thomson. Ross Matthews and Richard Foster. 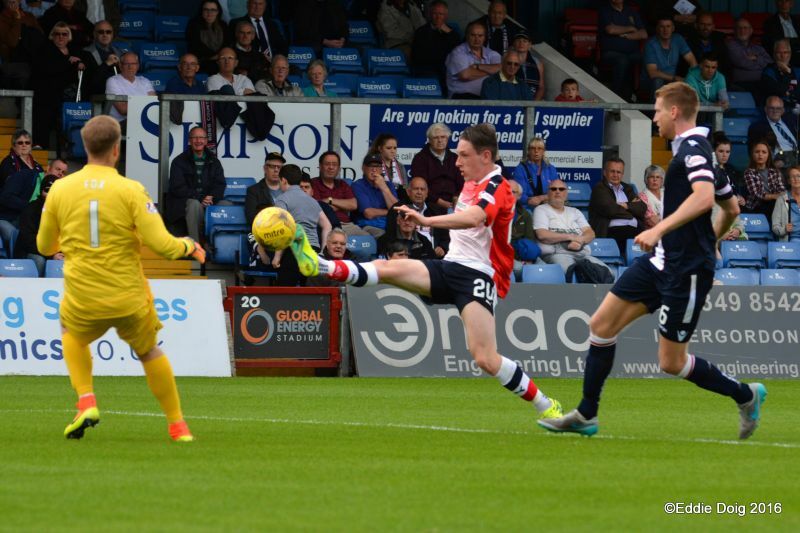 Bobby Barr fires into the County box. Yet another cross by Barr. Mcmanus drives past McEveley with ease. Matthews wins the 50 / 50 with Van Der Weg. 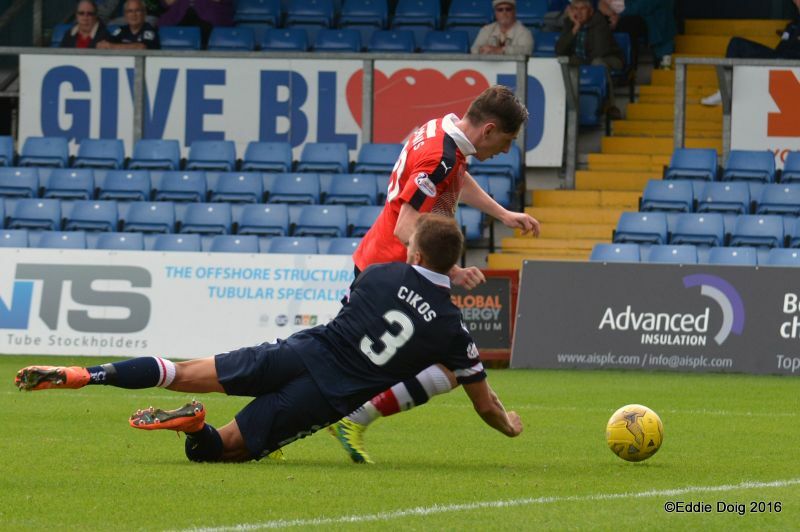 McManus rounds the diving Cikos. Vaughan attempts to beat McEveley. Fox punches clear with Jean -Louis Mvoto ready to pounce. 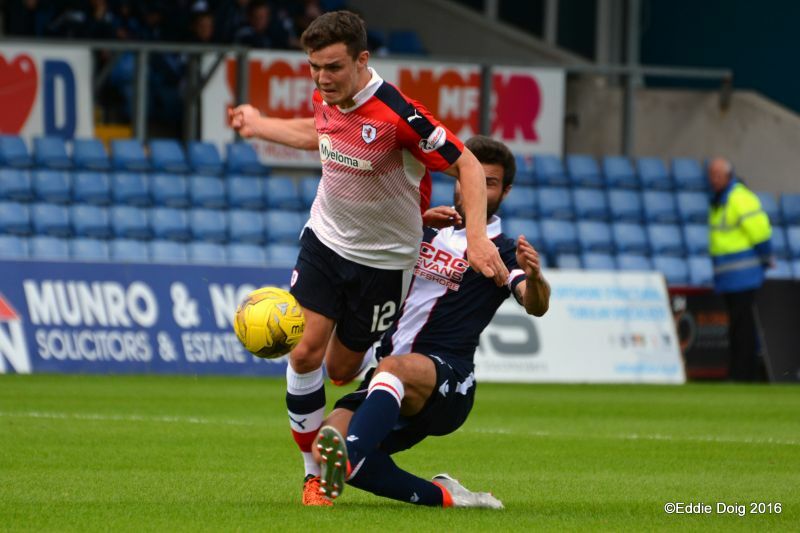 Iain Davidson and Alex Schalk. Davidson has an attempt at goal. Mvoto and ex Rover Brian Graham . Mvoto knocks the ball back across the County goalmouth. Mark Stewart waiting for the ball to drop. 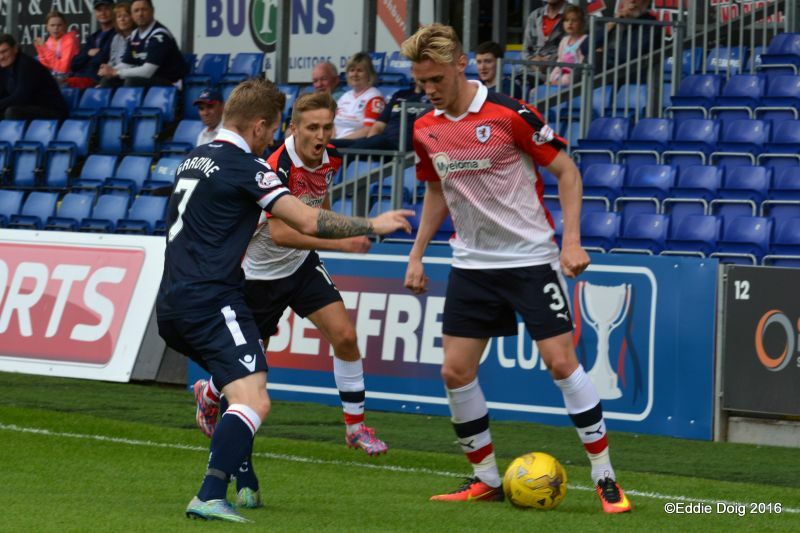 Kevin McHattie scores to make it 3-4 in the penalty shoot out. 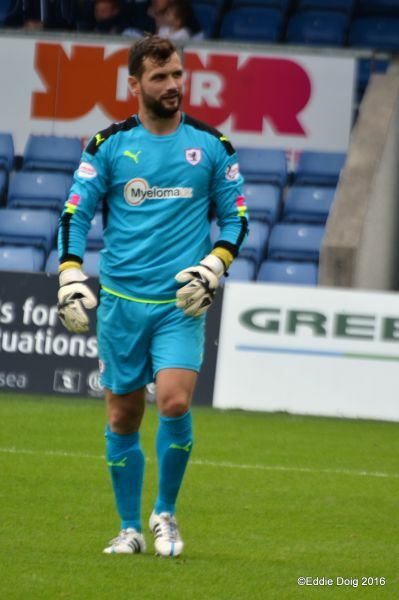 The "Cat" saves McEveleys' attempt to keep Raith in the shoot out. 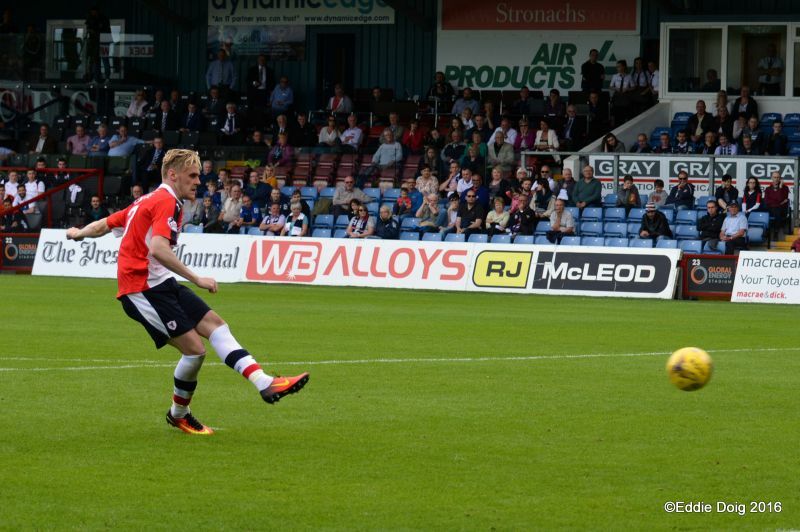 McShane sends the ball wide past Cuthberts right hand post. 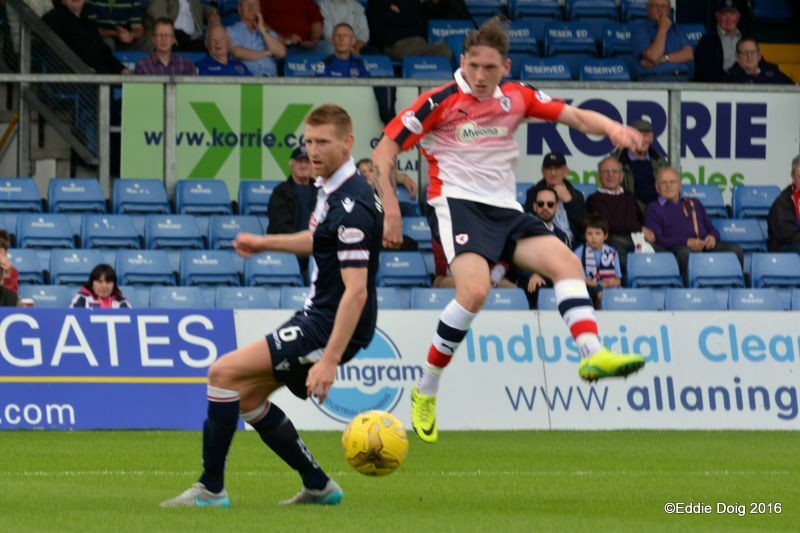 Raith get the extra point. The "Cat" who got the cream. 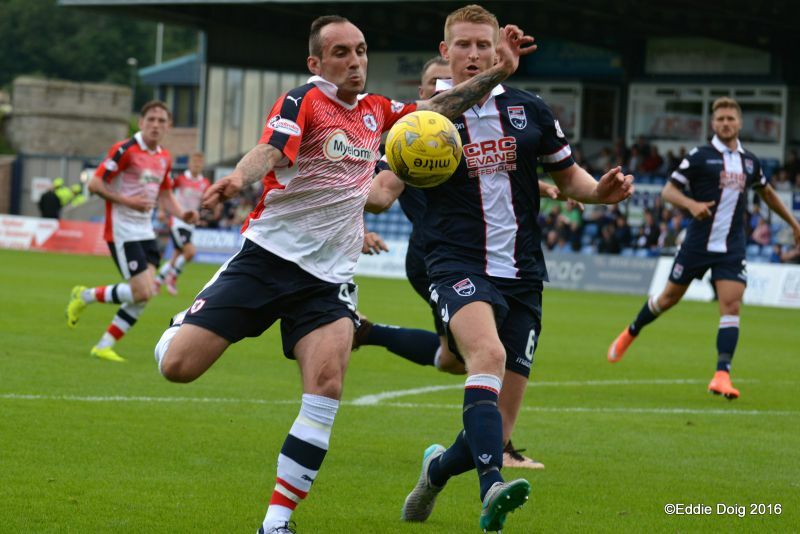 Raith Rovers head to Dingwall this Saturday, faced with the tough task of sustaining their 100% Betfred League Cup record against the holders, Ross County. 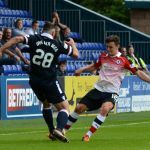 Tuesday evening’s results, which saw Alloa Athletic defeat Cove Rangers 4-0, coupled with Rovers late win over Montrose, have left Group D looking like a three way race for the top-two spots, with Raith leading the way on six points, while Ross County and Alloa, who both have a game in hand, sit on three. 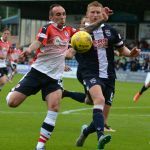 This weekend’s other group fixture sees Montrose host Alloa. 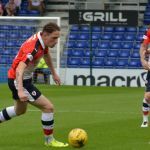 Ross County fans were disappointed to see creative midfielder, Jackson Irvine head to English Championship side, Burton Albion last week, but manager, Jim McIntyre has clearly targeted a different area of the park to strengthen over the summer, with five of his summer acquisitions defensive minded. 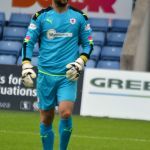 Goalkeeper, Aaron McCarey was brought in after he left Wolverhampton Wanderers, while former Scotland defender, Jay McEveley has joined from Sheffield United. 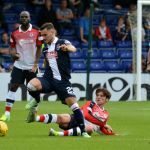 Christopher Routis, who can play in the centre of defence was signed from Bradford City, while full-backs, Kenny van der Weg and Erik Cikos have also been brought on board. 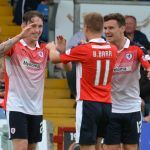 McIntyre will be hoping the new recruits can bolster a backline which conceded 61 league goals last term, although the season still saw the club finish in the top six, as well as the League Cup success. 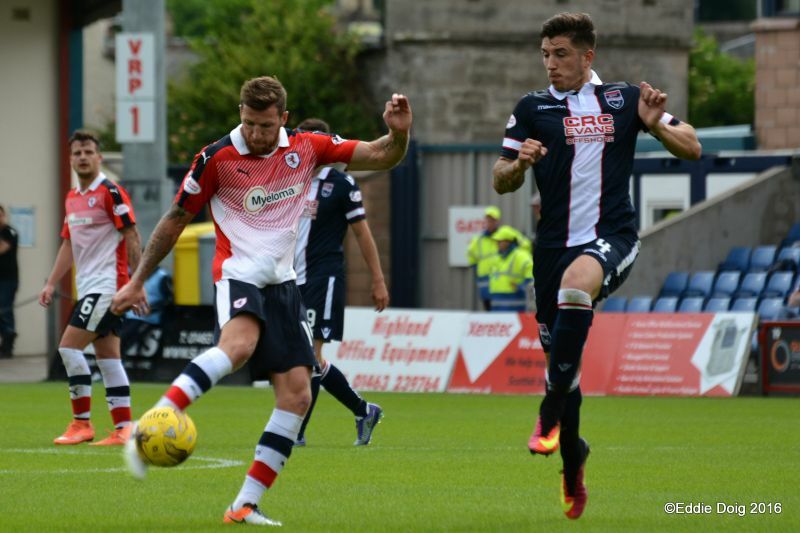 The two clubs have met twice before in this competition, with Raith winning convincingly on both occasions. 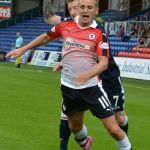 In 1994, an Ally Graham hat-trick helped the away side to a second round 5-0 win, while in 2012, goals from Greig Spence, Dougie Hill and a double from Brian Graham saw Raith advance to the third round at the expense of their top-tier opponents. 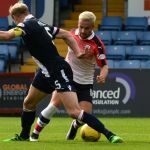 While the sides haven’t met too often in recent years, Rovers do have a good record against the Staggies, with six wins and four draws from their 13 meetings since the beginning of the 2009/10 season. Saturday’s match referee will be John McKendrick.